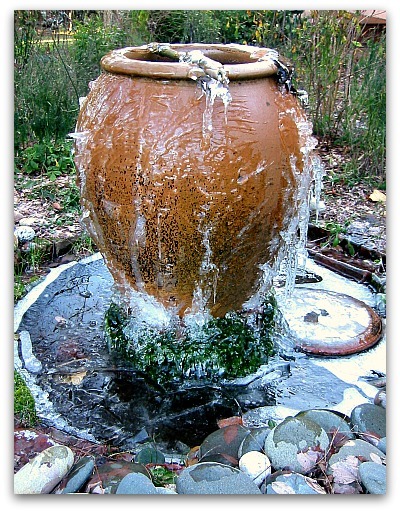 My fountain built in 2005, algae aged and still running. What’s my sign? (I thought you’d never ask.) As a card-carrying, water-bearing Aquarian, my home is not a home if not within sight or sound of water. In 1888 with the land cleared of towering trees and groomed for farming, the view from my front porch included a sweeping panorama of Puget Sound and Mount Rainier. Thanks to a mild climate and the vigor of Northwest flora, the forests have returned to obscure the once spectacular views. Pump: don’t skimp, buy a good pump; they last longer and tend to be very quiet when running. And remember the higher the water has to be pumped vertically, the larger the pump that is needed. Holding pan or basin: the container that houses the pump and the water source that is recirculated up through the fountain vessel. Bricks or stones to cover up, hide and beautify. Flexible tube: one end fits on the pump output and the other end up through a hole in the bottom of the fountain vessel. 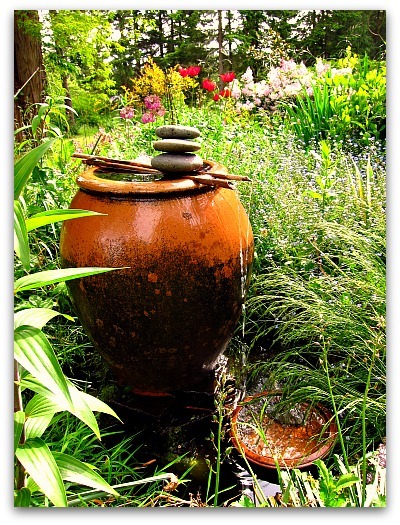 Water: locate the fountain near a water source since evaporation will require refilling in dry hot months. Boz had a great idea: use a kiddie wading pool for the holding pan. A standard large fountain basin can run about $200. For $16, I was able to substitute it for the larger version of Boz’s spa pool. Step 1: Dig a hole the size of the pool to hold and support the basin pan. Line the sides with bricks and the bottom with flat rocks to hide the cartoon goldfish emblazoned on the kiddie pool’s fine plastic surface. 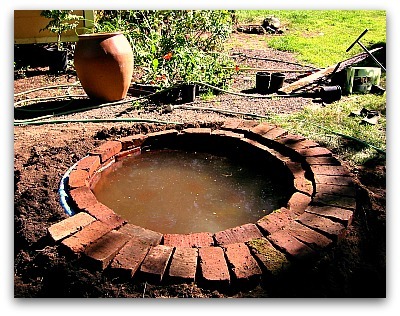 Step 2: Smooth out the soil surface around the sunken pool and lay brick or stones on outer perimeter of the pool to hid its plastic rim. Plants like ground covers will fill in the gaps in no time. Step 3: Build a brick platform in the basin to set the vessel on. This provides clearance for the flexible pump tube to move up through the drain hole of the vessel and also creates great sound as the water trickles down from a higher point. Step 4: Connect the flexible pipe to the pump in the holding basin, and the other end up through the platform to the fountain vessel’s drainage hole. If more than one hole, stop up the remaining ones with wine corks or drain stoppers so the water will fill up the vessel and move over the top rim. Step 5: Plug in the pump once the basin is full of water. Remember to keep filling as the pump will move water out of the basin and into the vessel until it ultimately flows over the edge and begins to recirculate. Step 6: (optional) I wanted to hide the electrical cord so I ran it through a hollow PVC pipe under my brick walkway. My pump had a 16 ft. cord. Step 7: Keep an eye on the water level. And you want to ensure good water movement to thwart mosquitoes from using the fountain as a breeding ground. Step 8: In the winter be sure to turn off the pump during long periods of freezing weather, as cascading water will freeze on the outside of the vessel and dry up the holding basin which will burn out your pricey pump. Alright, this Aquarian’s work is done (for now). Perhaps it’s time for a break in the hammock, where the fountain babble (and mine) is at home and at its best. 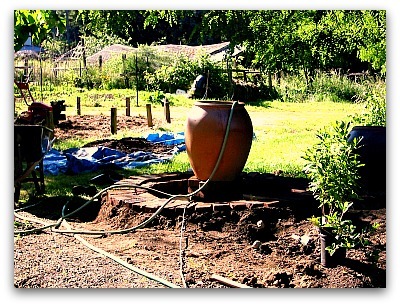 When I lived in Seattle, I fashioned this giant Jardiniere into a fountain, but when I moved it to Vashon, some bad handling ended a water tight career. Now it sits retired on a large madrona stump, a lovely relic well suited for a new role as garden sentinel. Filters are also a nice option to help keep the water clear and clean. I use a box filter which the pump fits into like a shoebox and the pumping action creates a suction which draws all the water through the filter. That might just be the coolest looking fountain I have ever seen. Well doned! 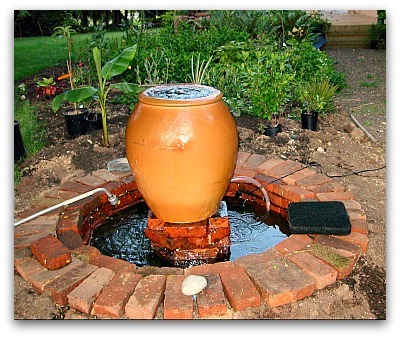 I built a similar fountain for my mother-in-law who lives in Arizona, but we just used the pot, put the pump and fountain nozzle in the pot, covered the unsightly pump with some leftover tiles, and, voila! Instead of spilling over it just sprays up a bit and back into the same pot. Oh, we had to seal the pot first. Yours is a masterpiece. Mine, pretty simple. Karen you fountain sounds great, especially if you want the water babbling sound and a quick solution. Good for you! Beautiful! Good thing Boz showed you what to use for a base-LOL! How clever! Tom, I love love love your fountain! 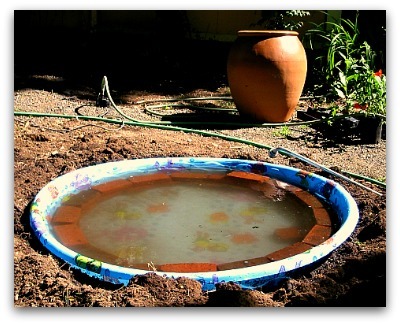 Genius to use a kiddies pool and surround it in bricks – so gorgeous! I will show this post to my DH (who happens to have a ton of Aquarius in his chart) so we can put our heads together to make a fountain too! Thanks for sharing! What a beautiful fountain! I love the design — especially the brick surrounding the pool of water. I cannot imagine my backyard without a fountain. It’s where I go at the end of the day to relax. I’ve seen this fountain in your yard. Since buying a house on Cemetery Road, I pass your property several times a week going to town. 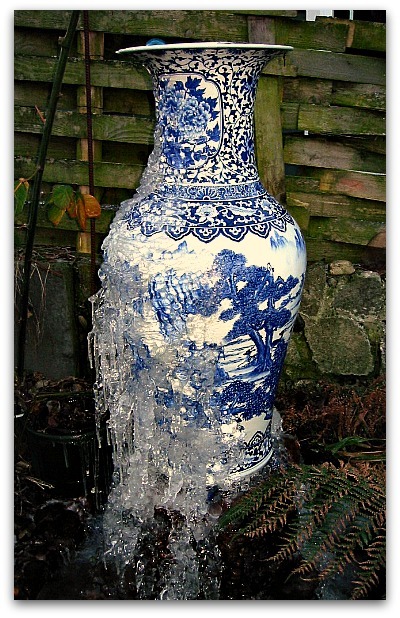 I have been wanting to incorporate a water feature in my garden, and now I know how. Thanks, and keep inspiring us. Roberta stole my line! Tom!! You are a genius! We must talk. That is brilliant. I couldn’t believe the results between steps one and two! Glad you included a sketch. Tom, you are so clever! I love it! Do you have any problems with raccoons dirtying up the water and clogging your pump? Anne I don’t have a raccoon problem as the vessel is to tall and slippery for them, but the one I had in Seattle became a food wash basin for crows. The bottom of the vessel looked like Tales from the Crypt when I cleaned it out. Apparently the crows loved fried chicken. There is a filter that I now use and really like: box filters. You simply place the pump in the box and run the electric cord through it and the outtake hose out of it to create a suction filter. I added a link to post as an example. You are so lucky to be able to make such wonderful things! The Arabs always had a fountain in their courtyards, it is a tradition I really miss; the sound of the gentle water trickling down is such a soothing one. Lovely work Tom. You can start a business with this! Waw, Tom! What a lovely home build fountain! Hi Marcia, the hammock is from Hatteras Canvas company. I bought it online about four years ago at hammockcompany.com. Been a great hammock, just bring it in the winter for longer hammock life. Tom…you’re as cute as the fountain is cool! I put together a very similar fountain. I was worried that critters would fall into the basin and drown. I used grate and now stack rocks over the grate to hide it. Looking at what you have there makes me believe I should have just let nature take care of itself. Very pretty. Hi Norah, you know I’ve never had any animal drown in the vessel or fountain, slugs notwithstanding. I once had a fountain that raccoons and crows used as a prep kitchen sink for their prey, but it was shaped differently with a convenient large lip at the top for sitting and eating. Very stylish fountain. Brilliant idea making this one. Maybe we can also make a smaller version of this one. Maravilhoso projeto, obrigada por partilhar conosco. I want to add a water feature to my new garden in the shady back corner, I will just have to keep this post bookmarked until next summer. Thanks for making it sound easy. This fountain is gorgeous….I have a large vessel and wanted to do a water feature with it ,.,,but my options for electricity are very limited without unsightly cords showing or a major electrical job. Do they have solar powered pumps I could use? Hi Karol, thank you for the nice compliment. I have tried a couple solar fountains and was disappointed with the output of each. They were better suited to a birdbaths or shallow vessels than to power a gurgling tall fountain. But I should qualify, I live in a very cloudy area with a lot of trees. And the ready made ones, fountain and all, tend to be a little cartoonish. Maybe check with a nursery or garden center and see if there’s one the staff is satisfied with in function, and one you’re satisfied with aesthetically. Good luck! Hi! This is beautiful! I want my husband to build me one but we don’t know what pump to get, which brand would you recomend?? Thank you!! Hi Gisela, thanks for the compliment. As far as pumps go, I really like a pump company called Beckett and I have used one called little giant and it worked fine too but hummed a little when pumping water. I would love to give this a try in the spring! However, I must admit that I know nothing about water features. What type and brand of pump do you use? I would hate to buy the wrong one. Thanks in advance! Hi Hillary, I really like Beckett pumps; they’re quiet and powerful. Look at the rating of flow based on height of the water, as is seen in a diagram on the box. I think I used a pump made to pump 90 gallons per hour (gph)for a three foot rise in water to the top. The higher the gph, the greater the flow and force of water. Beautiful! My only question is, do you leave it constantly running and if so, does it eat up alot of the electric bill? Carrie, I didn’t notice any change in the electric bill. I think the small pump uses low wattage. Beautiful! Love the blue and white one. Thanks for sharing. Thanks so much!! At my workplace, they are tearing down an old brick wall to made room for new equipment. I have been loading up the truck with re usable bricks for future garden projects….Now I have one!! Thanks for sharing!!! Thanks so much for posting this info.. Beautiful! How do you feel about solar pumps? I’m thinking they’re a good solution to electric lines and usage but not sure they’re strong enough to make the water flow well in this situation. That is amazing! I will add that to my to-do list ( bullet point #869). I wonder if I can just do it on an existing pond already. You know the plastic ponds. I got several on Craigslist for free. I love the blue vase one too. My favrourite color. You are quite the builder I must say : ) ! We just love it, smart, simple, easilly explained, beautiful, genius! We will share it, we will make it!! Love it Tom! I am going to do one myself this weekend. One quick question how did the kiddie pool hold up? Did you lay sand or something under it? 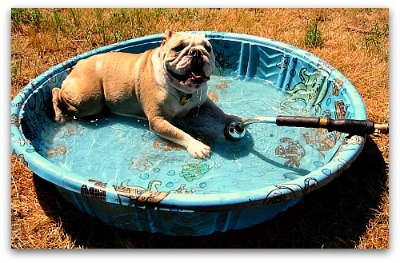 Hi Joe, the kiddie pool is still fine, and no leaks ever. The idea of sand underneath is great, but I didn’t do anything other than rake out any rocks and level the area where the pool was placed. I just kept the original soil there. Good luck! WOW!! I just love this fountain, thank you so much for your very detailed directions. I found it on Pinterest just today and I pinned it to my DIY board. I think I have the perfect spot in my back yard for it. I always put water for the birds, chipmunks and squirrels and I think they will absolutely love this. Thank you again for all the pictures and directions. Hi Maria, feel free to ask any questions if you have any. Thanks for the visit, and here’s to the sound of water and happy birds. Beautiful fountain! I love the sound of trickling water in the garden and how it attracts birds. I will have to try this in my garden. Thanks for the step by step tutorial! What did you use for the decoration on the top of the urn in the first photo? It looks like bamboo, and did you get the water to run through those as well? Hi Amber, yes those are bamboo sticks which were hollow. I cut a crescent notch in the bottom so when it touch the lip of the vessel, water ran through it and out, and drip melodically in the recirculation basin. Where did you purchase your vessel? I love the height, but am having difficulty locating one. Amanda I got it at a speciality pottery place in Seattle years ago, called AW Pottery. It was a second so it discounted deeply. Good luck! I am installing a 3-tiered garden fountain and the electrical cord comes up through the base in the bottom which has a 1 in pvc pipe. Once I run the electrical cord through what is the best method to use seal off so I do not have a leak? I was thinking of using some type of rubber stopper with a hole drilled for the electric cord or is there some type of plumbers putty (etc) that w0uld be better? So simple and so brilliant! I like the idea of the bricks inside. Thank you for a great post! 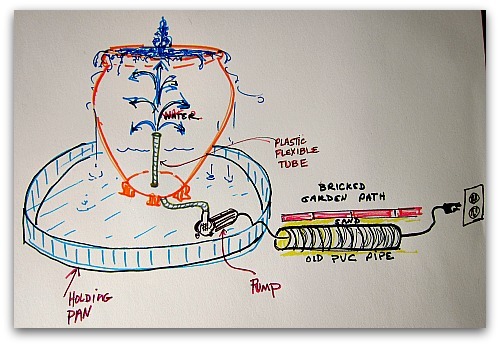 Great tips, we will be using them on our next small pond project!